3D TV is a big trend. But how does it fool your eyes? In the 1950s, there was a craze for 3D movies. Not very well-made ones by any means - most were sci-fi or horror B-movies - but they certainly made a splash. Film producers were trying to get their audiences back into the cinemas and away from their new-fangled TVs, and movies like Creature From the Black Lagoon and It Came From Outer Space served that role well. These 3D movies (the first was a 1922 flick called The Power of Love) used a red/green anaglyph dual-strip system. Before discussing what this means, let's take a look at how we see in three dimensions and perceive depth. Our eyes are roughly 2.5 to 3-inches apart. This separation means that the image each eye receives is slightly different. The light from distant objects reaches each eye roughly in parallel, whereas the light from nearby objects travels at different angles (the nearer the object, the more different the angles). This is known as convergence. The other process that's going on is focusing. When looking at distant objects, the lens in the eye is relaxed (or rather, the muscles that squeeze the lens are relaxed). The closer the object, the more work the lens has to do to keep it in focus. The brain uses all this effort, plus the image recorded by the light-sensitive cells in the eye (the rods and cones) to produce depth perception. When we're out and about, walking around, we're unaware of the amount of work that's going on to stop us accidentally walking into doorframes or walls. The eyes are continually feeding information to the brain, which it interprets as 'this object is close, that one is further away'. In essence, the convergence and focus points are equal for scenes viewed in the real world. When we look at a normal TV screen or a monitor, there is no depth perception - our eyes are just focused on the screen, and it's as if we're simply looking at a flat object (which we are, of course). There's no convergence needed for the 2D image on the screen either - it's just flat. So how do we turn it into something with depth? The early 3D movies made use of convergence (and ignored focus). If the camera recorded the same scene via two lenses positioned 3-inches or so apart onto two separate film stocks, then the two films could be played back in sync - one film for the viewer's left eye and the other for the right eye. But how do we ensure that each eye only sees what it's supposed to? Back in the '50s, the answer was to play back the black-and-white film in two different colours on the same screen. The film for the left eye was blue (or cyan to be more precise) and the film for the right eye was red. If you looked at the screen, you'd see the scene blurred between red and cyan, but if you looked at the screen wearing glasses where the left lens was red and the right one cyan, you'd see something completely different. The red lens would absorb all the red light hitting it and would only let through the cyan light. The cyan lens would let through the red light and absorb the cyan. Each eye would therefore only see the scene in the colour meant for it, so the left eye would see the left film and the right eye the right film. This system is known as the anaglyph technique, and is a passive system. It works well for black-and-white movies, since there's no colour in the scene to be incorrectly absorbed and confuse the viewer. You soon forget about the colour cast. For an example of an anaglyph image, have a look at the image above while wearing a pair of red/cyan glasses (available cheaply on eBay). Because the light reaching the eyes obeys the 'distant objects send light in parallel, near objects at an angle' rule, the brain can perceive an illusion of depth though convergence. However, the eye is only able to focus on the screen - there is nothing else there to focus on. A 3D movie will show things 'closer' and 'further away', but we can't focus on whatever we want to - we can only see in focus what the director wants us to concentrate on. For shock value, this generally means objects that seem to come close to the viewer's face. This difference between the convergence and focus points in 3D movies means that you're likely to experience eye strain and headaches if you watch something in 3D for too long, because your eyes are trying to do a lot of work that isn't necessary. 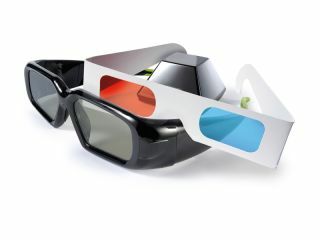 Moving back to 3D movies, the next big invention was the use of polarised light. Polarised light vibrates in a single plane, whereas the light waves in normal sunlight, for example, oscillate about many planes - some horizontally, some vertically, most in between. The lenses in polarised glasses only let through light in a single plane, which is a handy way of reducing the amount of light that reaches your eyes in bright sunlight. This time, the projectors display the left and right image streams using polarised light (the projectors essentially have big polarised screens in front of them), with the left images shown with horizontally polarised light, and the right with vertically polarised light. The viewer wears glasses with the left lens geared to horizontally polarised light and the right to vertically polarised light. Each lens only lets through the light with the correct polarisation for that eye. Providing the viewers keep their heads vertical, they'll see a 3D effect because each of their eyes sees a different set of images. Again, it's all about convergence rather than focus, so the same drawbacks (eye strain and headaches) can appear. However, this time there's no colour cast to the movie. This polarised light system first appeared in the early to mid 1950s, and quickly supplanted the old-fashioned anaglyph (two-colour) system, which has since been relegated to static images rather than films.